Thanks SO much for this post, Erin. Those of us with ADD (even mild forms) have such a difficult time organizing. A lot of what I’ve been doing is ruthlessly culling what I’ve got and keeping only what I really NEED. It’s hard to get distracted in the kitchen and forget to make coffee when the only things on the countertop are the cookie jar and the coffeemaker! Wow this was fantastic thank you Erin. And also thank you Shannon for asking the question. I do not have ADHD – but in reading this wondered if I had (I don’t – just googled it) as I do have similar behaviours. The thing about multiples is really interesting. As part of my life simplification I have tried to reduce so i only have one of everything where I can, but our family hairbrush got lost so many times that I have had to buy another for emergencies. I never remember to put things back (as my mind wanders onto something else), so we have to have toothbrushes in three seperate locations also. Really interesting – in fact very topical also. I lost one of the Kids DVD’s in March on holiday – found it today in a completely CD case in the kitchen – Bizarre! Great stuff! Another help? The post it note is your friend. You can purchase larger notes that are 5 by 7 in size. I have one fixed to the dashboard of my car with a checklist on it. (uniform, shoes, socks, ID, apron, coffee, phone, wallet) I check the list before I pull out of the driveway. Excellent!! I can’t fix a boss with ADHD but this article just gave me an incredible amount of insight into the mindset. I spend the bulk of my day organizing and cleaning up after the “hurricane”. Although, having multiple sets of everything and keeping everything out in plain sight rubs me the wrong way, it just might help him. Thanks for the article. I take notes, or lists like when I go out of town which is rare, I have a check list of items for ex: 2 swim suits, sunscreen, beach hats, etc. The kitchen can be distracting and I keep it decluttered as its easy to have things messy over one day. I agree with having duplicates like scissors, extra pens and tablets for notes, etc. Those living alone have it easy, as they can’t blame anyone for misplacing items or leaving a mess. Writing a list when running errands, grocery shopping, saves gas and time. I would like to recommend a book called “Organizing for the Creative person” by Dorothy Lehmkuhl and Dolores Cotter Lamping. The authors describe a life of “chasing dandelion fluff, first, one seed, then the other.” I have never been diagnosed with ADHD but am definately distractabe, and very visual, both have been helped by the insights in this book. In a workspace, I have found that the elimination of “visual chaos” is a help to keep me on task. I keep my “to work on” files behind my desk on a table, and only what I am working on in front of me. That is so, when I look up, there aren’t 300 “to do’s” staring at me. I keep a list of the files to be worked on to my right, but out of my direct line of sight, so I can get a quick view of what is to be done, rather than messing with the actual files. I don’t have ADHD but I am very visual and I think some of these strategies will work well for me. Thank you!! I have ADD (I’m NOT hyperactive!). I have scissors: in 2 places in the kitchen, my desk and by the phone near the family room; my husbands desk in his office; a couple of pairs in my art/creative/reading room; in my nightstand; in my bathroom; in each of 3 kids’ bedrooms. I have ADD and some visual processing tendencies, and several of the things on this list are also things I do. I would add “label storage” as if it has a name and a place to live, I am much more likely to put it away. However, this doesn’t work for my daughter, who is much more visual than I am. She lines up all her toys in groups, but refuses to store them in their proper bins. 😛 The hardest one, that would be the most helpful, is the accountability partner. I have asked over and over for friends to just come sit at my house while I clean, and everyone thinks I’m crazy! They all laugh like I’m kidding, but I”m totally not. Having someone there sitting on the couch is a forceful, visual reminder that I have something I am supposed to be doing, and it isn’t farting around on facebook. I used to teach GED classes to ADD and ADHD students. I would ask them to work on something (get them on task where they weren’t observing me) and very quietly time their time on task. Over the course of a week or so, I’d do this several times at different times during the period. The average became the “time on task” – how much I could expect each individual to work. From there, we’d try to extend that time if possible, and always come up with a quick distractor. For instance, one student could stay on task 9 minutes for composition, and 10 minutes for answering questions or reading easy material. We established his distractor to be writing his name frontwards and backwards. He’d write for 9 minutes, then write his name frontwards and backwards (mirror writing), then try to get back on task. He gave himself permission to go off task as a reward – but only briefly. It worked – he passed all his GED on the first try! 1. Hooks can sometimes work better than hangers. 2. If you can afford it, you might want to hire out certain tasks. Get a housekeeper, pay someone to do the laundry, whatever. Organizing Solutions for People with Attention Deficit Disorder – an easy read, with lots of pictures, and lots of good advice, too. ADD-Friendly Ways to Organize Your Life – more complex, but filled with good information. I have ADHD. 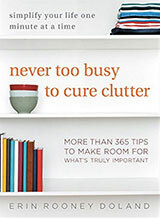 I also recommend the two books suggested by Jeri and add Organizing From the Inside-Out, by Julie Morgenstern. Her methods are infinitely adaptable and easy to implement, and all about finding what works for you. I used her methods for time management (Time Management From the Inside-Out) to manage my life when I was working as a church secretary, and her organizational techniques to re-organize the filing system (which was a disorganized mess before I got to it). I’ve always been good at organizing things, though. It’s keeping them that way that is my downfall. Tips for that would be wonderful – especially if they’re tuned to someone who is visually oriented, a kinethenic learner, and has two phrases that describe her housekeeping abilities: “the floor is simply another horizontal surface on which things can accumulate” (in other words, once the tables and chairs are covered, move to the floor); and “a box is just a contained pile” (in other words, just because it’s in a box doesn’t mean I have any idea where it is). I really like to have things out where I can see them, too, but the little paper stuff can get so lost. I have a desk drawer with hanging files and a folder for each day of the month to put things in that go with a day (like tickets, invitation with maps, papers to take somewhere) which is a great idea, but I hated looking in the folders every day to see if something was there. So, I finally figured to put a bright round sticker on my calendar if I put something in a folder. So, if there is a sticker on the day, then I look in the folder. Oh. Wow. I’m a bit late to the party here, but this post hit the nail on the head for me. I never thought of myself as a “visual” processor until I read your suggestions and realized that I use some of them. I don’t have full-blown ADHD (at least I don’t think I do), but I identify with the frustrations. Thanks for this post and thanks to those who commented. I am going to explore more of these ideas. Hi, my first comment here. First, I’d like to say that thanks to unclutterer and others, and my therapist, I’ve managed to overcome clutter, disorganized living, chaos and other things in like 6 months. I’m not over it yet, but I can say my house looks beautiful now, and it works for my projects and my lifestyle. I feel more confident, organized and tidy. I followed @Another Deb’s advice, bought Organizing for the Creative Person ebook, read it in two days, and it’s fantastic. It’s a great book, with lots of ideas for people like me, who don’t seem to have an internal order system. Order, like many things in life come from the inner self structure, it reflects somehow WHO you are and WHERE you are in your life right now. Thanks to all of you, you helped me through an enormous effort. My regards!! What a great post! Thank you. For work I use plain composition notebooks to take notes. I always decorate them with big stickers. I know which one is the most current with just a glance. There are so many great ideas here! Erin, thank you so much for responding to my question! I will be trying out your suggestions in the weeks to come. I definitely agree that my uncluttered spaces are the easiest to be in. In fact, I moved into a two-bedroom recently and removed all the “stuff” that I have gathered over years and put it all in the spare bedroom. Now I just need to start decluttering that area, LOL. I already donated two boxes but need to do more. Thanks again! 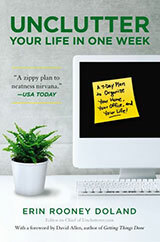 @Jeri – I actually bought Organizing Solutions two weeks ago and think it’s a great book! The visual examples coupled with the acknowlegement that some solutions won’t be visually appealing has helped a lot. Got the bullet points somewhere? I also do checklists like a few people mentioned. I don’t have add or adhd but I grew up in a cluttery house and never formed good organizational habits. The other thing I did was take pictures on my phone when the house was clean, so I can go back and see what different areas of the house are supposed to look like. I tend not to notice clutter building up so the pictures serve as a visual checklist. Thank you for the post and the comments. I am beginning to wonder if I am borderline ADD, but I certainly am a visual processor. Am going to ask my husband to read this so he can understand why our house is so untidy! (and help me improve of course!). The accountability partner is an interesting point – I got loads done the other day when I had an electrician working in the house, just him being around somehow kept me on tasks and less distracted.